Encircled by mighty limestone karsts, its waters a deep, dark emerald green, CHEOW LAN LAKE is one of the most mesmerising spots in Southern Thailand. An hour’s drive from camp, with a brief stop at a local market en route, you’ll swap your truck for a long-tail boat and set off across the lake. Bouncing across the open turquoise waters, Cheow Lan seems vast, but you’re soon squeezing between immense arrowheads of rock that seem to sprout out of the depths; believe it or not, millennia ago, these limestone outcrops were deep-sea coral beds. Your base for the day, about an hour’s boat ride away, is Rainforest Camp, whose floating bungalows are moored in a secluded cove. It’s a beautiful location, the expansive views best enjoyed from one of the camp’s canoes, as you paddle along the shore on the lookout for wildlife. Most kids, though, will settle for the simple pleasure of repeatedly hurling themselves into the warm water from the wooden pontoon. Over and over and over again. If you’re going to be staying the night at the lake, you’ll instead spend the afternoon trekking through the rainforest to a cave that’s home to a variety of interesting creepy crawlies, and the bats that feed on them; it’s quite a steep hike, slippery when wet, and a similar experience to the bat cave in Khao Yai National Park on Day 4, so you might prefer to skip this in favour of more time at the floating rafthouses. In the late afternoon, you’ll either head back by boat and bus to Elephant Camp or settle down for a memorable night on the water. 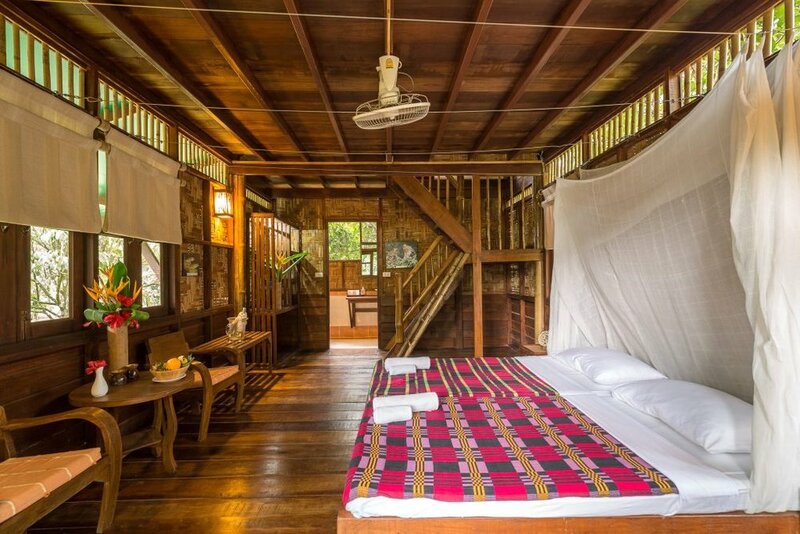 TOP TIP If you’re not staying with Elephant Hills, another recommended way of exploring Cheon Lan Lake is with Our Jungle Camp, staying at their new treehouses in Khao Sok and arranging your day tour [฿1500, ฿1300 for under-11s, free for under-4s, plus ฿300 national park fee (฿150 for under-15s, free for under-4s)] or overnight trip [฿2500, ฿2100 for under-11s, plus national park fee] to the lake through them. Their tours visit CORAL CAVE, a walk and wade (or swim, if the water’s high) through caverns to see the incredible stalactites that hang down like sheets of spaghetti (additional ฿200, ฿100 for under-11s, free for under-4s).